Boosts the Pokémon’s Speed in sunshine. Contact may poison or cause paralysis or sleep. X The larger its petals, the more toxic pollen it contains. Its big head is heavy and hard to hold up. X Je größer die Blütenblätter, desto mehr giftige Pollen sind in der Blüte enthalten. X Plus ses pétales sont grands, plus ils contiennent de pollen toxique. X Cuanto mayores son sus pétalos, más tóxico es su polen. Le pesa la cabeza y le cuesta mantenerla erguida. X Più grandi sono i petali, maggiore è la quantità di polline tossico che contengono. La testa è molto pesante. X 꽃잎이 클수록 많은 꽃가루를 만들어 내지만 머리가 무거워서 지쳐버린다고 한다. Y It has the world’s largest petals. With every step, the petals shake out heavy clouds of toxic pollen. Y Es besitzt die größten Blätter der Welt. Bei jedem Schritt streut es Giftpollen zu Boden. Y Il possède des pétales énormes. À chaque pas, ils sèment d’épais nuages de pollen toxique. Y Tiene los pétalos más grandes del mundo. Estos expulsan densas nubes de polen tóxico al caminar. Y Ha i petali più grandi del mondo. Ad ogni suo passo, i petali liberano fitte nubi di polline tossico. Y 세계에서 제일 큰 꽃잎은 걸을 때마다 흔들려 대량의 독 꽃가루를 흩뿌린다. Omega Ruby Vileplume has the world’s largest petals. They are used to attract prey that are then doused with toxic spores. Once the prey are immobilized, this Pokémon catches and devours them. Omega Ruby Giflor hat die größten Blätter der Welt. Sie ziehen Beute an und bestäuben sie mit giftigen Sporen. Wenn die Beute sich nicht mehr rührt, fängt dieses Pokémon sie und frisst sie auf. Omega Ruby Rafflesia dispose des plus grands pétales du monde. Il s’en sert pour attirer ses proies avant de les endormir avec ses spores toxiques. Ce Pokémon n’a plus alors qu’à attraper sa proie et à la manger. 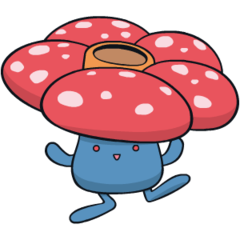 Omega Ruby Vileplume tiene los mayores pétalos del mundo. Los usa para atraer a sus presas y llenarlas de esporas tóxicas. Una vez que ha inmovilizado a las víctimas, las atrapa y las devora. Omega Ruby Vileplume ha i petali più grandi al mondo. Li usa per attirare la preda per poi ricoprirla di spore velenose. Una volta immobilizzata la preda, il Pokémon la cattura e la divora. Omega Ruby 세계에서 제일 큰 꽃잎으로 먹이를 유인하여 독 꽃가루를 끼얹는다. 움직이지 못하게 된 먹이를 잡아먹는다. 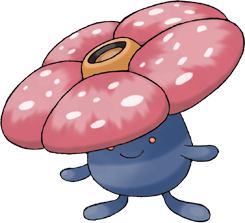 Alpha Sapphire Vileplume’s toxic pollen triggers atrocious allergy attacks. That’s why it is advisable never to approach any attractive flowers in a jungle, however pretty they may be. Alpha Sapphire Giflors giftige Pollen rufen böse allergische Anfälle hervor. Deshalb ist es ratsam, sich keiner schönen Blume im Dschungel zu nähern, so anziehend sie auch sein mag. Alpha Sapphire Le pollen toxique de Rafflesia déclenche d’affreuses réactions allergiques. C’est pourquoi il est conseillé de ne jamais s’approcher des jolies fleurs trouvées dans la jungle, même lorsqu’elles sont magnifiques. Alpha Sapphire El polen que contienen las esporas tóxicas de Vileplume causa unos ataques de alergia muy agudos. Por eso, no es aconsejable acercarse a ninguna flor selvática, por muy bonita que sea. Alpha Sapphire Il polline velenoso di Vileplume scatena paurose reazioni allergiche. Per questo motivo si consiglia di non avvicinarsi mai a nessun fiore di bosco, per quanto bello possa essere. Alpha Sapphire 독 꽃가루는 심한 알레르기를 일으킨다. 정글에서 아름다운 꽃을 발견해도 섣불리 다가가지 않는 것이 좋다. Red The larger its petals, the more toxic pollen it contains. Its big head is heavy and hard to hold up. Blue The larger its petals, the more toxic pollen it contains. Its big head is heavy and hard to hold up. Yellow Flaps its broad flower petals to scatter its poisonous pollen. The flapping sound is very loud. Stadium Scatters allergy-causing pollen from its broad petals. The larger the petals, the more pollen is scattered. Gold It has the world's largest petals. With every step, the petals shake out heavy clouds of toxic pollen. Silver The bud bursts into bloom with a bang. It then starts scattering allergenic, poisonous pollen. Crystal By shaking its big petals, it scatters toxic pollen into the air, turning the air yellow. Stadium2 It has the world's largest petals. With every step, the petals shake out heavy clouds of toxic pollen. Ruby Vileplume's toxic pollen triggers atrocious allergy attacks. That is why it is advisable never to approach any attractive flowers in a jungle, however pretty they may be. Sapphire VILEPLUME has the world's largest petals. They are used to attract prey that are then doused with toxic spores. Once the prey are immobilized, this POKeMON catches and devours them. FireRed Its petals are the largest in the world. It fiendishly scatters allergy-causing pollen from its petals. LeafGreen The larger its petals, the more toxic pollen it contains. Its big head is heavy and hard to hold up. Emerald In seasons when it produces more pollen, the air around a VILEPLUME turns yellow with the powder as it walks. The pollen is highly toxic and causes paralysis. Diamond Its petals are the largest in the world. As it walks, it scatters extremely allergenic pollen. Pearl Its petals are the largest in the world. As it walks, it scatters extremely allergenic pollen. Platinum Its petals are the largest in the world. As it walks, it scatters extremely allergenic pollen. HeartGold It has the world’s largest petals. With every step, the petals shake out heavy clouds of toxic pollen. SoulSilver The bud bursts into bloom with a bang. It then starts scattering allergenic, poisonous pollen. Black Its petals are the largest in the world. As it walks, it scatters extremely allergenic pollen. White Its petals are the largest in the world. As it walks, it scatters extremely allergenic pollen. Black 2 Its petals are the largest in the world. As it walks, it scatters extremely allergenic pollen. White 2 Its petals are the largest in the world. As it walks, it scatters extremely allergenic pollen.